A little more than a year ago, Bart Bonte's Me and the Key sent us all on a voyage of self-and-key-discovery. But the hunt for the self/key is an eternal quest, is it not? Luckily, the journey has been lengthened by another 25 levels in Me and the Key 2. As you progress through this series of abstract thinking puzzles and mini-games, maybe you'll discover that the key that you were searching for was around your penguin-thing's neck the whole time. Truly, a moral for the ages. The goal of this game is always simple: find the key and click on it. It's the finding of it that's the hard part. Figuring out the controls in this game is often the entirety of a puzzle, but I can tell you that both keyboard and mouse will need to be used. In some levels, looking for clues is important. In other levels, trial and error will show you the light. If you're stuck, it never really hurts to click around the screen frantically or hammer on the keyboard until something happens. Analysis: The weakest part of "Me and the Key 2" is the mini-games. It isn't really a spoiler to say that they are clones of the classic snake and breakout genres. You could pull someone who's been in a coma since 1987, plop them in front of the computer, and they would recognize what game it was within five seconds. They would then, perhaps, say, "You woke me up from my coma for this?" and they would have a point. But it would only be fair of you to leap to the game's defense. "Ah, but check out the puzzle levels!" you would say. The puzzle levels are mostly fantastic, lovely little bite-sized brainteasers that play with your perceptions and require some definite out of the box thinking, and fortunately, puzzle levels outnumber mini-games greatly. In fact I would only count four levels as true mini-games. Unfortunately, the very last level is one of the mini-game levels and this ends up as a bit of an anticlimax. Still, the game overall more than delivers that Bonte charm we know and love. Me and the Key 2 Walkthrough now available! Drag the penguin up with the cursor and click the key. Look at the letters in the balls, and type them on your keyboard to make them pop. When the last ball pops, the key will fall out. Click on it. Click all the white blocks to change them into purple blocks in the shape of a key. This is a game of snake. Click anywhere on the screen to cause the snake to make a clockwise turn. Don't hit yourself or the walls as you gobble up the orange balls and the key. Click on the penguins to spell out "me and the key 2". The penguin with "2" on its chest will then have a key around its neck. When you move the cursor left and right, the bands move left and right. Guide the ball through the gaps in the bands all the way to the bottom to land on the key. Drag the pale pink band on the far left to reveal a key behind it. Click on the ball, and then click on the new balls as they appear. When you click on the final ball a key will fall out of it. Move your mouse into the space to the upper right of the penguin and then don't move your mouse. The penguin will thought bubble a key, which you can then click on. Keep the cursor on top of the ball while it float to the top, where it will break and drop the key. Drag the ball to the other penguin's head without touching the walls. Type the letters of the balls to pop them. You can't pop the letters K E Y even if you try. When you get down to just K E Y, you'll get the key. Click on the penguins and the letters on their chests will go through the alphabet. Make the penguins spell K E Y and the Y penguin will have a key around its neck. This is another level of snake and plays the same as before, only it takes longer before the key appears. Hit delete on your keyboard three times. Spot the differences and click on them in the upper tv screen. They are: the bottom ball of the thought balloon, the left eye, the beak, the rightmost bar in the background, and the orange ball. The key will drop from the ceiling. This is an odd one. You're dragging both the light pattern and the ball at the same time. Once again, you don't want the ball to leave the light pattern. Just go slow and it shouldn't be a problem. Change all the blocks to white color, they will form a key. 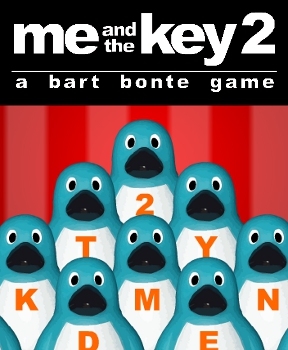 Click on the penguins to spell out "Bart Bonte" (the name of the designer). This is another snake game. This time, you must also click on the blocks to clear a path for the snake. Click on the blocks will also count as a click to turn the snake, so be careful! Basically, you will need to clear a vertical path in the center column of the pink blocks, which will cause two blue blocks to appear. When you get the orange ball from within the pink squares, another orange ball will appear within the blue squares. When you get the second orange ball, the key will appear in the upper left, and you must collect that. Good luck, it's tricky! Click on the penguins to spell out the number of the level, "twenty-one". Drag the first keyhole to the lower left corner to find the second keyhole. Drag the second keyhole to the right upper side, not the upper corner, just below that, to find the third keyhole (you also have to drag the first keyhold over to see through the layers). Finally, drag all the keyholes up to the upper left corner to find the key. Match the backgrounds on the tv to the orange background, and make all the penguins crouch down, and the key will drop from the ceiling. This is like level 8 but it lasts longer. Click on each new ball as it appears. This is a game of breakout. You must clear three sets of blocks and then get the key with the ball. And that's the end! Great game. I love games that make you think. Ugh. The mini-games are just about intolerable. It might just be that I prefer puzzles and mysteries, but one would think that by 2010 people could come up with more original stuff than Snake and Breakout. I'm stuck at # 12, I read the hint but it does not work for me! Anyone else stuck there? Type all the letters that you see to pop the balls on the screen. When you get down to just K-E-Y, the key will appear. Had a problem with level 25 breakout control -- mouse would freeze up and had to start over too many times... otherwise, great game. Thanks! Thanks Joye, that's exactly what I was doing, but nothing happened. Keyboard is working fine so it must be a bug. I switched browsers and it worked. Rage-quit on level 14. Stupid snake. I turned the quality down to low and zoomed out to make the flash movie smaller and it's still really slow. To anyone stuck on the last level and wondering if it's worth it: although beating the last level is the only way to see the super-cool JIG logo, other than that, there's not much to see. If you're going mad with frustration, don't sweat it. horizontal motions with the mouse move the ball, vertical motions with the mouse move the path. As the ball will only move horizontally, you need to simultaneously bend the path to accommodate the motion of the ball. Enjoyed it at the beginning, "finally one of these puzzle game, without stupid arcade sequenzes thrown in", then came level 14... unnecessary (same for 25, not original), otherwise would be a fine game. those of us with little to no peripheral vision will never get past #24.
yep, two rage quits on level 14 here too. great game up till then, but i probably won't go back. I managed to get 14 eventually. 17 is a problem if you do not have a large area for the mouse. I found the game to be challenging and fun. Made it to the end, some people might think that when they win this it's not going to be worth it, but it could be like catarsis to some people. Since you're actually dragging the layer rather than the keyhole, I think you can just drag everything into the upper left corner to begin with. That is, drag the big keyhole layer so the keyhole is in the upper left, then repeatedly drag up and left drag inside of it until the next keyhole appears, then drag up and left inside of that one to find the key. Nothing too hard - had to repeat a few levels once or twice, but I got through it relatively easily. Still fun, though. lvl 24: print screen, open paint, ctrl+V, look. Level 14: Really, Bart? ANOTHER snake level but harder? You're more creative than that. This coming from a player who has always enjoyed your games & given positive reviews (go ahead & check) except when you resort to *ahem* laziness. I managed to complete every level, but the design was weak. The snake only being able to turn left? Ridiculous, especially at the prolonged level. A lot of the actual puzzles were just trial-and-error, with little to no clue as to what you were supposed to be doing. I'm not even going to comment on how bad the breakout level at the end was. Seems to me this was not the puzzle game it was billed as. Man, I HATE level 14. And snakes who bite their own tails. Wow I cannot get past lvl 22!!! On level 9, I wait for the thought bubble and then the key pops up an i go to click on it but it disapears. WHAT DO I DO? for level 9, you can't move the mouse, or else the thought bubble disappears. You have to position the mouse in a spot on the screen where once the key appears, it is already located behind the pointer without you having to move it. When the key is already on the pointer, click on it. There is no more game beyond level 6 because no one has ever made it past level 6. Anyone who claims otherwise is lying. There just wasn't enough new content here to make me want to slug away at the interminable and uninspired levels to this game. The clunky graphics slow down the whole game and the lag is debilitating here. Not one of the better Bonte titles.